Weather -Snow or ice pellets changing to freezing rain this morning then to periods of rain or drizzle near noon. Fog patches developing near noon. Snow and ice pellet amount 2 to 4 cm. 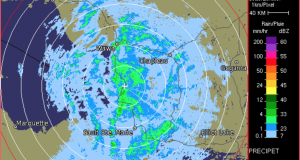 Wind northeast 20 km/h gusting to 40 becoming south 20 near noon. High plus 1. UV index 2 or low. Tonight	Cloudy. Flurries beginning this evening. Local blowing snow late this evening and overnight. Local amount 2 to 4 cm. Wind south 30 km/h gusting to 50. Low minus 2. Wind chill minus 8 overnight. There is still a freezing rain warning and a Winter Weather Travel Advisory in effect. News Tidbits – Today is the start of the 72nd Wawa Men’s Bonspiel and begins at 4:00 p.m.